We have chosen to limit demos of Design Master Plumbing to current users of our HVAC software. If you are interested in our plumbing software, try our HVAC software first. Once you are successful using that, we are happy to show you our plumbing software. The software generates an isometric diagram directly from your plan view pipe layout. You can now do in seconds what once took hours. 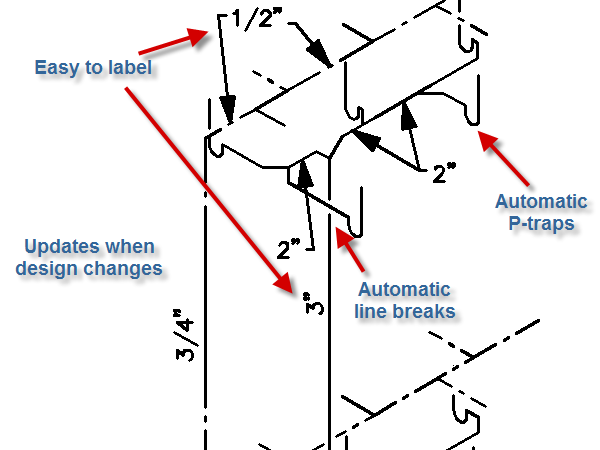 Line breaks, p-traps, and other graphic elements are drawn automatically. Pipes in the isometric diagram are linked to the same records in the database as the plan-view pipes. The isometric can be updated with a single click when the floor plan changes. Inserting sizes and labels from the database is easy. When the pipe size is changed, the labels on both the floor plan and isometric are updated.